Cuppow lids turn a mason jar into an adult sippy mug. 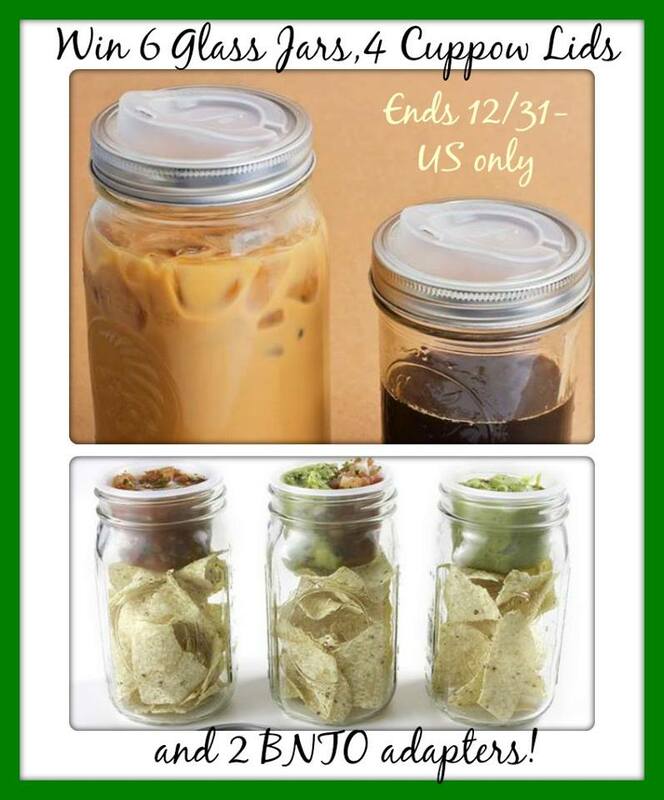 Glass canning jars make great travel mugs as they do not leach toxins into your beverage like plastic or metal travel mugs do… easy to clean, made of heat-resistant glass, cheap, durable, and when sealed they don’t leak. Now these are some really cool cups I think I want some for myself! 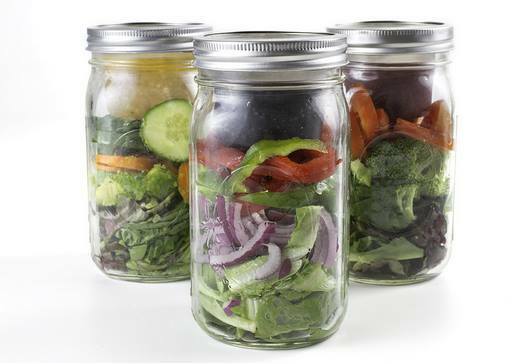 And Cuppow is now introducing a new item to make carrying salad dressing easier — the BNTO canning jar lunchbox adaptor. Check our how cool the BNTO Jar Adapters are in this short clip! One lucky winner will receive 4 assorted Cuppow drinking lids + 2 BNTO Jar Lunchbox Adaptors + Set of 6 Heritage Ball Pint Jars! Giveaway ends 12/31/13 at 11:59 pm ET! Open to US residents 18+ and older. Water, I can’t get enough. I like taking flavored coffees with me. Flavored tea is also a great option. Iced Tea is my go-to to-go drink! I almost always have it with me but its in a large water bottle that always spills when I try to drink while driving or walking! I love to take Dr. Pepper in a cup full of ice. I am mainly a soda drinker but i also like iced coffee. My favorite on the go drink is iced tea! I love my peach mango Ice drink no calories. My favorite on the go drink is ice water! My favorite on the go drink is French Vanilla Iced Coffee. In the summer it’s vanilla iced coffee and in the winter it’s a hot no foam vanilla latte. Iced coffee… even in the winter! This is awesome!! Thanks for the giveaway! I take either coffee or water. I don’t go anywhere without a sippy cup of water. I take hot tea with me everywhere! I take hot tea with me everywhere! I would love this set! I like sweet tea on the go! I have coffee in the am, so it’s a smoothie for on the go! These would be great. Thanks! My favorite on-the-go drink is a chocolate peanut butter protein shake! My favorite drink is a Hazlenut iced coffee. I love hot chocolate when I am on the go in the winter and plain old water in the summer. I love hot chocolate when I’m on the go. I am a coffee girl! This would be perfect for those iced coffees. Also so interested in a way to bring lettuce and not have all soggy by the dressing. my body runs on coffee!! Iced coffee for the summer, hot coffee in the winter. I like ice coffee while on the go. I love any try of wrap on the go! Water is my favorite drink to take with me but I also love lemonade. I love green tea and coffee! My on the go drink is coke. I love coffee! I always spill…. Sweet Tea is my favorite. I love having coffee, iced or hot, to sip on the road. Diet coke! but I’m trying to add more water into my beverages. My favorite to go drink is water. I’m all about iced tea. Especially the green tea. Tastes sweet without adding sugar. I love coffee or a smoothie on the go! I love drinking coffee on the go, it is so good! This would be great because I always brew my coffee at home! I love to take Iced tea anywhere I go. I love good ice water. I love granola bars for quick on the go snacks. ice tea is my all time fav drink to go ! iced coffee! I love to have it, no matter what the weather is like. My favorite on the go drink (or drink anytime) is fountain pop- diet and regular mixed. I can always find a soda on-the-go, but I can never find tea made MY way. So I like to take along my favorite iced tea. These chilly mornings prompt me to take my spiced apple cider on the go!